17/02/2012 - Russia today took a major step toward upholding international anti-bribery standards by depositing its instrument of accession to the OECD Convention at a ceremony at the OECD in Paris. 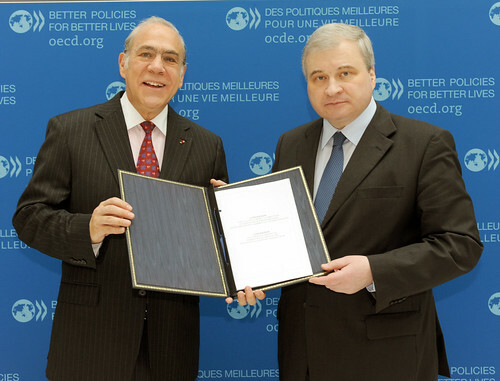 OECD Secretary-General Angel Gurría received Russia’s instrument of accession from First Deputy Minister of Foreign Affairs Denisov and First Deputy Minister of Justice Fedorov. Russia became the 39th Party to the OECD Anti-Bribery Convention on 17 April 2012, 60 days after the ceremony. 25/05/2011 - On the occasion of the 50th Anniversary Ministerial Meeting, the OECD invited the Russian Federation to join the OECD’s Working Group on Bribery and to accede to the OECD’s Anti-Bribery Convention. Secretary-General Angel Gurría signed an exchange of letters with First Deputy Minister of Foreign Affairs, Andrey Denisov, and Russia’s Minister for Economic Development, Elvira Nabiullina, at a ceremony with US Secretary of State Hillary Rodham Clinton during the OECD Ministerial Council Meeting.